Second Avenue between East 58th and East 52nd streets will get a dedicated bike lane, according to the DOT. MIDTOWN EAST — The city is moving to plug a gap in Midtown’s bike lanes by adding a stretch of protected bike lane on Second Avenue, according to the Department of Transportation. 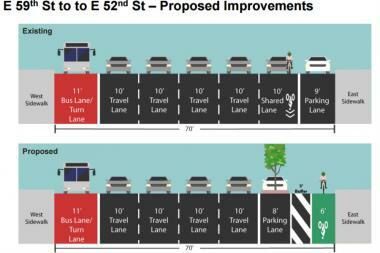 Second Avenue between East 59th and East 42nd streets will be getting a protected bike lane so southbound cyclists don’t have to share a busy lane of traffic, according to a presentation of the plan by DOT at a Community Board 6 Transportation Committee meeting on Monday. The corridor in question currently has a shared lane with painted markings. But cars take over the road during peak hours, and some bike advocates see this as dangerous for novice cyclists, according to the DOT. Under the DOT’s plan, the stretch between 59th and 52nd streets would be a protected curbside lane, shielded from traffic by a five-foot-wide buffer zone and a parking lane. The stretch from 52nd Street to 48th Street would be protected at off-peak times with the parking lane turning into an afternoon rush-hour traffic lane, while the lane from 48th street to 42nd Street would be protected with the exception of morning and afternoon rush hours, when the parking lane would be turned into a traffic lane, according to the DOT. In an effort to protect pedestrians as well, the plan calls for concrete islands at the intersections between East 59th and East 52nd streets, which would give people crossing the street a better line of sight and decrease the distance between curbs, the agency said. The stretch of Second Avenue slated for a new bike lane has a high volume of cyclist traffic even without a dedicated lane, thanks in part to bikes coming over the Queensboro Bridge at 59th Street, according to the DOT. Ridership has risen 26 percent since 2013, from 1,646 cyclists over a 12-hour period in 2013 to 2,070 in 2016, the agency said. It was not immediately clear when DOT plans to start work on the new lane.